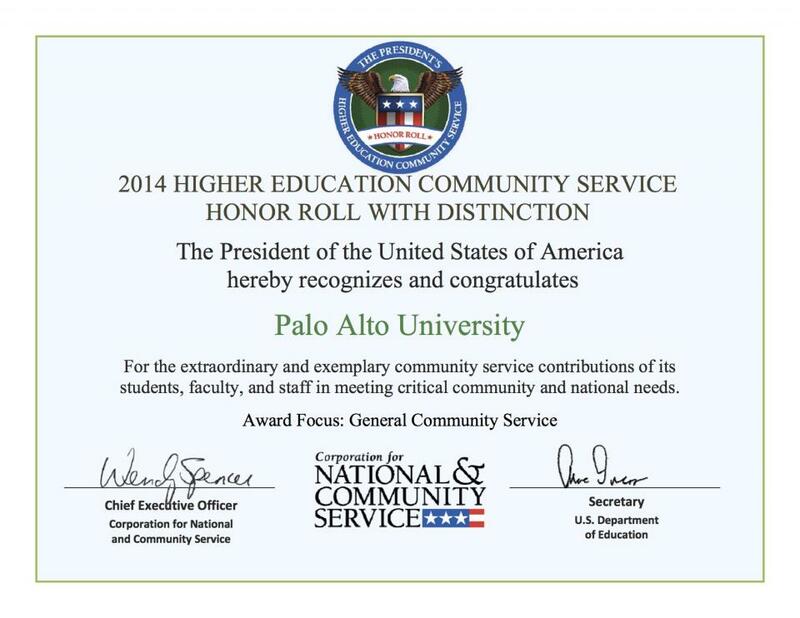 After receiving the honor of being named to the President’s Higher Education Community Service Honor Roll in 2013, Palo Alto University (PAU) has received the honor again for the year 2014. The Honor Roll is a program of the Corporation for National and Community Service (CNCS), the federal agency that engages more than 4 million Americans in service through Senior Corps, AmeriCorps, and the Social Innovation Fund, and leads President Obama's national call to service initiative, United We Serve. This designation is the highest honor a college or university can receive for its commitment to volunteering, service-learning and civic engagement. Learn more about the PAU's community service efforts.